Welp, the 2018 MLB draft is just a few hours away. I will be live blogging tonight starting at 6 central. You will have to refresh your browser to see updates to the post. All weekend long I read mock draft after mock draft after mock draft. Based on those prognostications, it is going to be a wild night. Players were taken all over the first round. Some players were taken in the top ten and the bottom ten. It was weird trying to navigate any reasoning for those permutations. So, tonight should be very unpredictable. Mayo: Anthony Seigler, C, Cartersville (Ga.) HS — This continues to be a good landing spot for the prep catcher who has made headlines because of his switch-pitching skills as an amateur. He’ll be a solid all-around catching prospect at the next level. Callis: Anthony Seigler, C, Cartersville (Ga.) HS — Another team homing in on bats, Chicago could go for Groshans, Larnach, Lavigne, Meadows, McCarthy and Schnell. If Virginia left-hander Daniel Lynch goes in the first round, this is the most likely destination. There are other high school bats, who tended to be missing from rankings at the back of the first round most of the spring, that are also flying up boards. Nick Schnell from Roncalli, Indiana is an outfielder who might sneak into the first round. Shortstop Osiris Johnson, a cousin of Jimmy Rollins, is gaining a lot of traction towards round one. Mount Carmel’s Alex Thomas has out on a jet pack and looks to be added to the first round HS bat mix. Add in outfielder and Mike Trout wannabe, Mike Siani, and it could get crazy starting at about pick 10 through 40. I have only been in on two picks for the Cubs this spring. At first, I wanted Wichita State 3B Alec Bohm. That affection carried through mid-March when he just took off from the mid 20s and is now expected to be a top 3-5 pick. For the last month, I have been sold on Oregon State’s Trevor Larnach (pronounced Lar-Nick). He’s a 6’4” 210 lb. left-handed hitting right fielder with good defensive skills. In 56 games this year, he’s cranked 17 HRs while hitting .322 with an OBP of .444. The problem is he might not be there at #24. If he isn’t, there’s not one prospect I am really sold on. There are many I like that I have talked about the past five months, but no one who knocks my socks off. 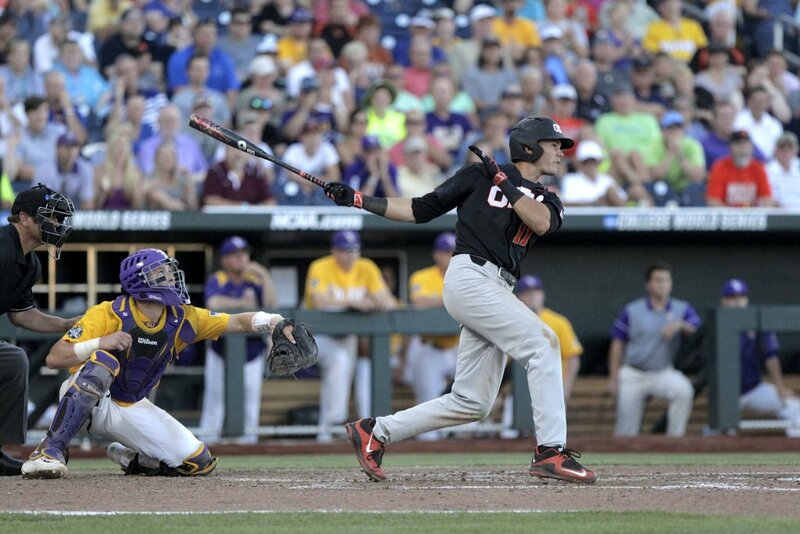 Part of me says to take Seth Beer of Clemson. The power hitting OF/1B used to be the top ranked player in the draft class. He’s been knocked down because of his wooden bat experiences with USA Baseball over the past two summers and his defensive liabilities. To be honest, pro coaching should be able to assuage concerns people have with his skills. His strike zone management, though, is unparalleled in this draft. By the time the second round rolls around to the Cubs at #62, a lot of things could happen. Players will be rising and falling. Compensation picks could picks and competitive balance picks could be traded. Who knows who will be available when the Cubs pick. The Cubs, more than likely, will go bat heavy tonight. The one pitcher I would like to see them take in the second round is closer Tanner Dodson of California. He should be a late second round pick, but he is one arm that might be the surest bet the Cubs could take. He could move quickly as a reliever with his athletic capabilities and he also plays the field when needed. But Dodson could also be a starter as he has four pitches that he can throw for strikes. That versatility to do both makes him a little more valuable than most arms that will get taken tonight. Another name I like for a late second round pick is Tyler Riley from John A. Logan College in southern Illinois. Riley originally began his college career at Oklahoma State and then transferred to the junior college known for producing power pitching. Logan also became the home of former Cubs 2016 pick, Brenden Heiss, formerly of the University of Arkansas, who the Cubs could redraft on day 2 or 3. Out of all the drafts in the Theo era, this draft is easily the most unpredictable. I have a good feel for who should be available in the first two rounds for the Cubs. I just don’t have a good feel, though, for who will actually be there. This is a deep draft with not a lot of separation of talent in the first 40-45 picks. And the late risers, some mentioned above, are going to make it a fun evening to watch. Be prepared for anything.